While A New Hope was a great movie, many people consider The Empire Strikes Back to be the greatest off all 6 movies. It's certainly one of the greatest sequels to a great movie - it's considered to be up there with The Godfather Part II. Han Solo’s “I know” line in response to Leia’s declaration of love was adlibbed by Harrison Ford. It’s become an iconic Star Wars quote. A very early draft of the script saw Han Solo going in search of his Father-In-Law, Ovan Marekal, who has political ties with Lord Vader. Luke Skywalker flies to the 'Bog' Planet where he meets a frog-like Jedi named Minch, who teaches him the ways of the force. That's right, Yoda was frog-like and was going to be called Minch. Can you image it, "But Master Minch, you cannot die!" Empire was the first movie to have a number by its title in the opening credits - V. The original Star War was not called A New Hope or Episode 4, this came later. That dude to which Han Solo retorts, "Then I'll see you in Hell!"? just before he heads out to find a certain missing Jedi? That's Cliff from Cheers AKA John Ratzenberger. The classic "The first transport is away!" line was delivered by Mark Hamill. 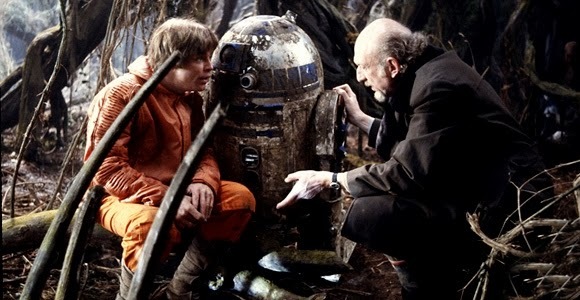 In order to avoid sharing creative rights, George Lucas decided to avoid using a major film studio to finance this film. Instead, he bankrolled the $33 million productions himself. Three characters lose limbs - the Wampa that attacks Luke, C3PO when shot by the Storm Troopers on Cloud City, and of course Luke lost his hand when Vader sabered it off! If you liked that, In a faraway galaxy has plenty more bits of Star Wars trivia - check out from what animals the infamous blue milk came from or what was the original title of Return of Jedi.